Bacon, Beer, Food Pairings, Ribs, Viennas, Woody’s Bacon, Woody’s Brands. 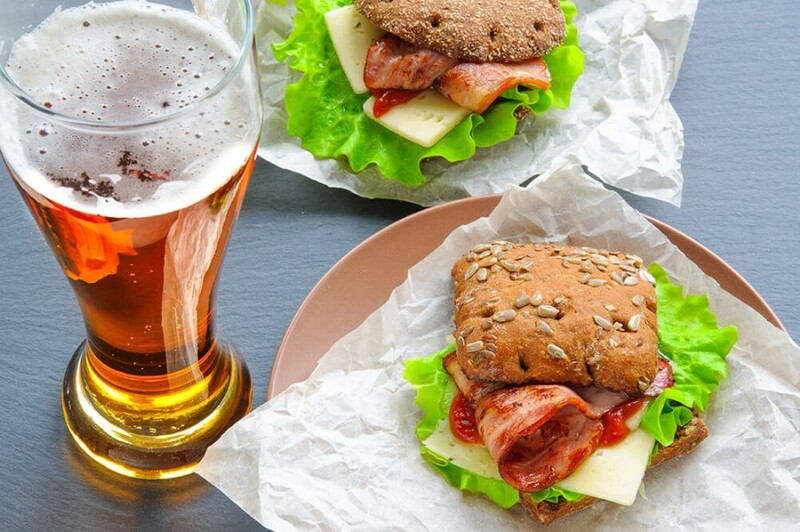 If you haven’t tried a bacon and beer food pairing, you are missing out on a rollercoaster of explosive taste. It’s a culinary combination that will send favorite pairings like cheese and wine packing and give whiskey and chocolate a run for its money. We’ve compiled a few bacon (there are some pork dishes as well) and beer pairing suggestions to guide on this food journey. Whether you like pilsner, pale ale or lager, there’s bound to be a beer that will complement bacon just the way you like it. Enjoying beers around the braai is practically a South African ritual. If you are planning on tossing some bacon onto the grill (if you’re not, you should be! ), then consider enjoying your grilled bacon with a Striped Horse Pilsner. Pilsners usually contain the right amount of hoppy-ness so that its bitterness complements the smoky/saltiness of the bacon. Not to mention, washing down a pilsner can act as a palate cleanser, meaning you can enjoy the experience like it was the first time again. The Woody’s Streaky Bacon is braai-ready! If you want your taste buds to dance with joy, you have to try our Woody’s Bacon and Plum Bites served with an Everson’s cider of your choice. The beverage will play up the fruity tang of the plums and cut through (in a good way) the smoky goodness of the bacon. Sweet cider plays up the fruity aspects of pancetta while the bubbles cut through the layers of fat. So while this isn’t necessarily a bacon and beer pairing, we’re pretty sure that you be happy that we added this: a spicy vienna dish and wheat beer coupling. To complement scrumptious, mouth-tingling meal, pour yourself a mug of CBC Amber Weiss. Inspired by the original German wheat beer, this beverage is gentle and subtly hopped, which means it won’t compete with the dish’s spiciness; instead, the wheat base will add a delicate layer of earthiness that mingles well with heat. This a real “treat yourself” moment. Our bacon and maple cupcakes (yes, you read that correctly) are to die for as is, but for a next-level experience, you can enjoy them with sips of stout. We recommend Citizen Beer’s Pacifist Winter Porter or the Stellies Eike Stout. The bacon and maple syrup combo creates a salty-sweet explosion that’ll have you reaching for another cupcake before the first one is finished. Add a super roasty stout- some of which have notes of maple- to the mix, and you will have the right amount of bitterness dancing harmoniously with the sweet and smoky hints from the cupcakes. Keen to invite some friends over and impress them with a mouthwatering meal? Well, we highly recommend our Chinese Pork Ribs– this Asian-inspired dish packs the right amount of punch and zing What’s the perfect beverage to accompany these delicious ribs? Jack Black’s well-rounded Butcher Block Pale Ale should do the trick. The flavourful tang of the ribs will embrace the complexity of the pale ale. The union will dance on your taste buds! So, what are you waiting for? Create a foodie bacon and beer bucket list and tick the taste adventures off as you go. Let us know which one is your favourite!